ACMiN AGH is a new research institute founded within the premises of university. Its research activities focus on various aspects of nanotechnology, physics and chemistry and materials sciences: from quantum mechanical modelling till industrial applications. Axiom angewandte Prozesstechnik GmbH has over 25 years of experience in separation technologies. Axiom focuses on membrane technology applications and provides custom-tailored solutions for gas and water treatment. Axiom attaches great importance to high sustainability of its separation processes. The Department of Atomic Physics at the BME is one of the leading laboratories in Hungary in surface and thin film research. It is equipped for laterally resolved and in-depth chemical analysis of surfaces, coatings and thin films by XPS, AES and SIMS methods. 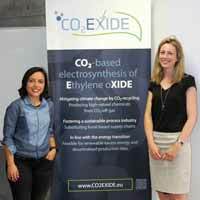 The Energy Institute is conducting impact-related studies to systematically evaluate the effects of a roll out of the specific electrocatalytic factory for the production of renewable bulk chemicals developed in the project CO2EXCIDE. EPC gGmbH – EPC project corporation for Climate. Sustainability. Communications. EPC offers project management and target group specific PR, including the development of communication strategies and their practical application in renewables, climate and sustainability projects. Fraunhofer IGB’s Straubing branch, Bio-, Electro- and Chemocatalysis – BioCat focuses on the development of chemical, biotechnological and electrochemical catalysts, process development and the conversion of renewable resources and CO2 into value added products with these catalysts. ISSP UL is one of the leading research institutions in Latvia within the fields of material sciences, nanotechnology and photonics, providing internationally competitive experimental and theoretical research, plays an important role in education and offers innovative solutions for industrial applications. The Schaeffler Group is a global automotive and industrial supplier. Top quality, outstanding technology, and exceptionally innovative spirit form the basis for the continued success of the company. With more than 90,000 employees, Schaeffler is one of the world’s largest family companies. Siemens AG is a global powerhouse positioned along the electrification value chain – from power generation, transmission and distribution to smart grid solutions and the efficient application of electrical energy – as well as in the areas of medical imaging and laboratory diagnostics. Having been ranked 8th in the UK for research, the University of Southampton conducts high quality education and research with successful track record of industrial collaborations and generation of patentable work. 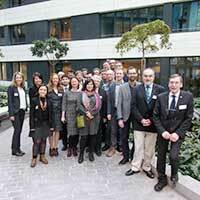 The Faculty of Engineering and the Environment has 33 projects H2020.